Using The WiiMote To Control PC Games | OhGizmo! I haven’t tested this myself, as I’m still Wii-less, but maybe Andrew can give it a look when he gets back. Or, even more fun, you people can try it out and let us know how it went in the comments. Either way, there you have it: using the Wiimote on a PC. Fun stuff. Read the stipulation for the glovepie download. Now with Wiimote support! Play Wii games on your PiiCii. Download version 0.22 of GlovePIE here. Just extract it to a directory of your choosing. Then run it. There is nothing to install. If you want to associate .PIE files with GlovePIE, you will need to do so yourself. Either the author of this software is a SUPERLIBERAL LEFT WINGER, A NAZI, or a militant MUSLIM, or all of the above. In any case, Carl Kenner is an anti semite and a RACIST. A despicable man indeed. Or possibly its a matter of security, imagine if someone were to setup a wiimote on a bluetooth enabled pc or laptop, said laptop or pc could have sensative information on it. 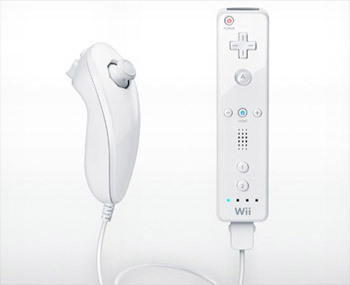 Wiimote with its wireless connection could potentially be a security risk. Imagine being able to mess around on a computer from a safe distance where no one would suspect you, granted youd still have to be relativly close, but the possibility is there. Just a thought. Also seems more likely at least to me anyway. Or imagine if Hillary Clinton comes into the power and she makes Carl Kenner becomes National Security Advisor to her and advices her to make military strikes in Israel. Weird how a simple software for game controllers is becoming involved in politics. I wonder what the palastinians who want to use it will do? If they are victims – why forsing them to move out of israel for a piece of software? With all the respect – this is a bullsheet and if you ask me – it is already hacked to bypass the limitation (which is hilarious to me). And about problem itself – as to who is right and who is wrong? Palastinians(Hamas/Fatach)? Israelis? If there was a simple right – the issue would have resolved long time a go. It seems that even Carl (or who ever he is) believes he have a solution – peace. Go a head – let's see you convincing Hamas to sign a peace agreement – for that to happen – they will want all the Israelis to leave Israel and let them have the country for themselvs. So what he is saying actually is the Israel should give up, give the whole country to the palastinians and stay without a country. Hmm… Well he's right – he have nothing against jews – he just want Israel to give up (the result will be a mass murder of the Israeli people by the palastinian). So – as an Israeli – I don't think so.